CANCER STEM CELLS CAUSE OF METASTASIS? DEBATE I: Are all Cancer cells mutagenic and proliferative or only the core mother stem cells? Evidence for Refuting the CSC theory: Sean Morrison director of the University of Michigan Center for Stem Cell Biology and his team of researchers have determined in Nov 2010 that most types of melanoma cells can form malignant tumors, providing new evidence that the deadliest form of skin cancer does not conform to the increasingly popular cancer stem cell model. In addition, the researchers found that melanoma tumor cells can change their appearance by switching various genes on and off, making the malignant cells a stealthy, shape-shifting target for researchers seeking new treatments. As reported in Michigan News Both findings fly in the face of the cancer stem cell model, which states that a handful of rare stem cells drive the formation, growth and progression of malignant tumors in many cancers. Some supporters of the model have suggested that melanoma might be more effectively treated by taking aim specifically at these rare cancer stems cells, rather than attempting to eliminate all melanoma cells. But after conducting an exhaustive search for this elusive sub-population of tumor-forming melanoma cell, the U-M team concluded that it probably does not exist. The researchers analyzed 44 sub-populations of human melanoma cells, and all 44 had a similar ability to form tumors when transplanted into mice. "Some have suggested that melanoma follows a cancer stem cell model in which only rare cells are able to proliferate extensively and form new tumors. Our results suggest that most melanoma cells are capable of driving disease progression and that it won't be possible to cure patients by targeting rare sub-populations of cells," Morrison said. "We think you need to kill all the cells." The study found that tumor-forming melanoma cells have the ability to throw a genetic switch that changes the types of proteins expressed on the cells' surface. The study is the first to present evidence for this type of pervasive "phenotypic plasticity" among melanoma cells from patients. Patterns of surface proteins are used to identify different cell types and are commonly called cell surface markers. "The fact that these markers are turned on and off by melanoma cells raises the possibility that melanoma cells may also turn on and off genes that regulate clinically important characteristics like drug resistance and metastatic ability," Morrison said. "The ability to transition between various states may make melanoma more difficult to treat." The authors stress that while their results argue against a cancer stem cell model for melanoma, their findings do not invalidate the model. In fact, certain leukemias and other cancers appear to follow the model. "It will be critical to determine which cancers follow a stem cell model and which do not, so therapies designed to target rare sub-populations of cells are not inappropriately tested in patients whose disease is driven by many diverse cancer cells," Quintana also from the UM Stem Cell Center said. "The cancer stem cell model says that tumor cells are organized hierarchically, and that only the cells at the top of the hierarchy form tumors. Cells at the bottom of the hierarchy can't," Morrison said. "In our model, all these cells can form tumors," he said. "And they're phenotypically different from each other not because they're hierarchically organized but because they're just turning these surface markers on and off." The U-M team found that all tumor-forming melanoma cells gave rise to progeny with a variety of marker patterns, and that all of those sub-populations retained the ability to form tumors. The marker changes appeared to be reversible, rather than being associated with a transition from tumor-forming to non-tumor-forming states, as the cancer stem cell model would predict. Evidence for existence of CSCs and their role in cancer: In a study published in the journal Cancer Cell in 2014, researchers at Oxford University and Sweden’s Karolinska Institutet said they had tracked gene mutations responsible for a form of blood cancer back to a distinct set of cells which they say are at the root of the cancer’s spread. 'It's like having dandelions in your lawn. You can pull out as many as you want, but if you don't get the roots they’ll come back,' explains first author Dr Petter Woll of the MRC Weatherall Institute for Molecular Medicine at the University of Oxford. The 15 patients involved in the study had myelodysplastic syndrome (MDS), a blood disorder which causes a drop in the number of healthy blood cells, and develops into acute myeloid leukaemia in around half of all cases. Leader of the Pack: There are more than a dozen companies that have reached clinical trials in patients specifically targetting cancer stem cells including Boston BIomedical which was acquired by Dainippon Sumitomo Pharma Co. for US$ 2.63 billion and Oncomed at US$ 300 million valuation on NASDAQ. The leader of he pack of cancer stem cell tergetting biotech companies is Stemcentrix. It has achieved an astounding valuation of US$ 5 billion without any sales and has raised half a billion dollars. This Californian start up is backed by heave weight investors Fidelity Investments, Artis Ventures, Silicon Valley Bank, Sequoia Capital, Elon Musk, and a US$ 200 million investment from one of the most successful investors in the world Peter Thiel and his Founders Fund (earlier co-founder of Paypal, dscovered Facebook and invested in AirBnB and Palantir). Stemcentrx, formed in 2008, is developing a small-cell lung cancer therapy that homes in on a target, DLL3. The product, which uses an antibody to guide a cell-killing drug to its target, appears to be effective in some small-cell lung cancer patients. In a recent trial of 80 small-cell lung cancer patients, which was testing safe dosage, tumors shrank more often than they did in response to the only approved drug to treat the cancer, topotecan. For patients whose cancer exhibits the stem-cell marker the drug aims at, benefits were larger. It’s one of three drugs the company is already testing in human trials. Why do top investors put in so much money at such crazy valuations in such early stage highly risky venture? Probably based on the success of Pharmacyclics Inc., a cancer drug developer that was acquired by AbbVie Inc., for $21 billion in May 2015. Scott Dylla an ex Stanford stem cell targetting researcher and ex tech banker Brian Slingerland co-founded Stemcentrix. All this smart money is betting that CSCs are present in cancer biology and play the role of the mother bee in a beehive. My conclusion: Both sides are showing evidence in this debate. It is finally irrefutable results in human clinicals of stem cell targetting drugs that will put in the last word. It may be that both are right. Different cancers may have different biologies some with CSCs and some without. Or cancer may be the most scary shape shifter of them all constantly changing its avatar. But if the CSCs are the cause of all recurrences of resistant cancers and we can kill the CSCs with allopathic and natural drugs then we may be able to save millions of lives. his shows the initial theory of how cancer stem cells can maintain a tumour. Even with conventional cancer therapy the cancer stem cells survive and the cancer can relapse but if we can identify cancer stem cells and develop specific treatment the patient outcome could be improved as the tumour would regress or enter remission. 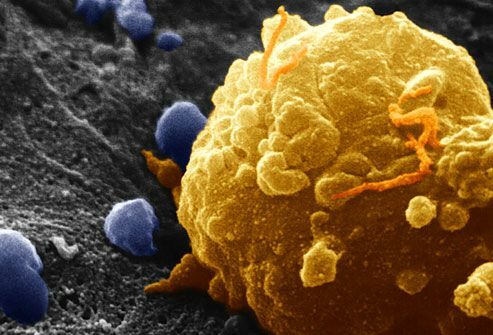 This shows another theory of how cancer stem cells can conserve a tumour. There may in fact be more than one type of cancer stem cell so with conventional cancer therapy the tumour mass is maintained. But again if we can identify cancer stem cells treatment could be improved. Pictures from Dr Richard Clarkson (Cardiff University) showing how Cancer Stem Cells grown in the laboratory can be killed over time – a model of tumour regression.